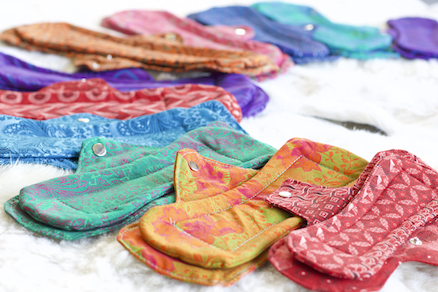 Why choose reusable sanitary pads? Our high-quality reusable sanitary pads are made from natural materials and are free from harsh chemicals, plastics, glues, synthetic fibres and bleaches which lowers the risk of rashes, irritation and infection. Using natural sanitary products helps your body find its innate rhythm and can reduce menstrual pain and discomfort. On average a woman will use around 14 400 disposable pads and tampons in her lifetime which end up in landfills and our natural habitats, they take hundreds of years to decompose and are toxic to the environment. Combine the blessing of being a woman with making a difference to the earth by lightening your load on her. A woman can spend approximately R36 000 on disposable sanitary products in her lifetime. 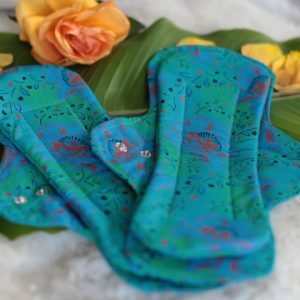 The initial outlay for reusable sanitary pads is more than disposables but they will last for many years which means huge savings - making it a long-term investment... and no last minute trips to the shop to get pads. Moontime is the time of the month when women bleed. A time to go within, rest and digest, listen to your heart and harness your intuition. Your body and cycle are interconnected with the moon, the earth and all the elements. Honour the gift of being a woman by knowing your own individual cycle. You can get a deeper understanding of how to balance your menstrual phases, which is both empowering and liberating. I have not been much of a pad girl but have always been aware of the environmental and health implications of disposable sanitary products… without doing much about it. When I found out that Anja was making reusable pads I loved the idea but it was only when I tried them that a whole new world opened up for me. I love being so intimately connected to the process of my body and have found that I am more in tune with my cycle. I love MoonTime pads design, find them extremely comfortable and was surprised by how good the absorption is. There is something quite special being so close to my blood and moontime process and instead of finding washing my pads gross, I feel honoured to be able to. I got some MoonTime pads and used them for the first time recently. They were absolutely fantastic. They are comfortable, they stay in place, catch the blood well and they didn’t leak through at all which was fabulous. They washed off so easily. I just kept a bucket of water next to the toilet and dropped it in. I didn’t even have to use soap – it was quite profound. I can highly recommend MoonTime pads. They are certainly changing my experience of having my moontime in an authentic integral way without putting any more rubbish into the planet. I also get left with a bucket of very nutritious water for the plants. Thank you very much. They’re absolutely wonderful and I love the fabric, it’s really fantastic. I found that the pads are very absorbent and are easily washed. To be able to wash ones own blood brings one back to the appreciation of the menstrual cycle and ones body. I recommend this pad to anybody who wants to experience the deep gratitude for ones body and conscious shoppers who will know that they are also contributing to a cleaner world. Wow, what a lovely product, I have always been a tampon girl, but due to unforeseen circumstances, had to look for an alternative. Since day 1, I am a total convert! I've been using these pads for a while and not yet a leakage in sight... and for me that is unheard of as I unfortunately am of those girls who have a delightfully heavy flow. They are totally comfortable - moulding completely to your lady bits and there is never a weird sound, which you get with conventional pads. Best of all... THEY ARE SO PRETTY! I feel like I make a fashion statement over my flow time. Thank you MOONTIME! So much love for the creators of such uplifting positive products just for us.